The ICRC has a longstanding history in Somalia spanning over 35 years of conflict response and humanitarian relief. This has included visits to detainees during the Ogaden conflict with Ethiopia (1977-1978) as well as a major emergency assistance operations during the extended civil war and climate-related famine of the early 1990s. The ICRC continues to assist populations afflicted by a combination of protracted armed conflict and harsh climate shocks such as drought and floods. 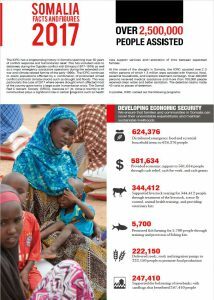 This was particularly the case of 2017 where severe drought which affected most of the country gave rise to a large scale humanitarian crisis. The Somali Red Crescent Society (SRCS), because of its close proximity with communities plays a significant role in certain programs such as health care support services and restoration of links between separated families. 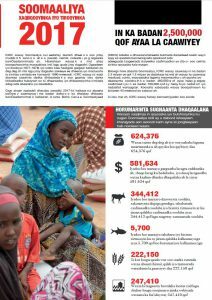 At the onset of the drought in Somalia, the ICRC assisted over 2.3 million persons of which 1.3 million were assisted with financial, food, essential households, and livestock treatment campaign. Over 480,000 persons received medical assistance and more than 700,000 people received clean water and better sanitation. The detention teams made 43 visits to places of detention.